The colored filled Valentino's resort look is far different from their fall dark hues. Pier Paolo Piccioli and Maria Grazia Chiuri, the duo behind the Valentino's designs went for a bright hues with this collections. The collection is filled with neon pinks, sky blues, lace flowers, full skirts, peplum tops and embroidered lace on tulle gown. The collection in all is exquisite and uplifting--just what you need for party circuit. I'll take one of each please! Yes! @Keshia E, right?! The greens are amazing. Love this collection tots! Great looks, thanks for showing us!! I love the green color! Looove the green colour and dresses are amazing! 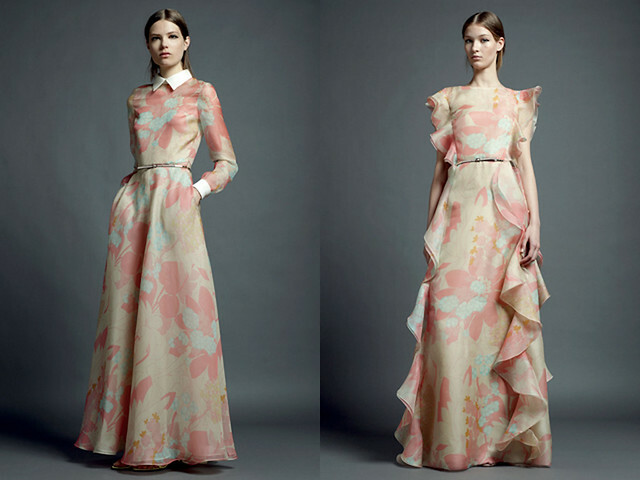 Valentino collections are always incredible feminine. Love it! Following your gorg blog dear! Love the green dress from this awesome collection. Lovely collection. Loving the colors and peplum details.